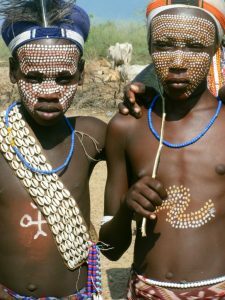 Many of their traditional rituals might have originated with another much larger tribe: the Hamar,which is of the same lineage but numbers approximately 30,000. These two groups speak nearly identical, Osmotic languages and much of the symbolism found in both groups’ ceremonies suggest a rich, cultural history together. The Karo people differentiate themselves from many of the neighboring tribes by excelling specifically in body and face painting.They paint themselves daily with colored ochre, white chalk, yellow mineral rock, charcoal, and pulverized iron ore, all natural resources local to the area. The specific designs drawn on their bodies can change daily and vary in content, ranging from simple stars or lines to animal motifs, such as guinea fowl plumage, or to the most popular – a myriad of handprints covering the torso and legs. Both the Karo and the Hamar men use clay to construct elaborate hairstyles and headdresses for themselves, signifying status, beauty, and bravery.